The melon-headed whale's head is a rounded cone giving the animal its common name. The body is more or less uniformly light grey except for a dark grey face – sometimes called the "mask". The flippers are long and pointed. The dorsal fin is tall with a pointed tip – reminiscent of its relative the killer whale. When viewed in profile, its head is not as rounded as the pygmy killer whale and this may aid identification. This whale is capable of very fast swimming, particularly when startled. In flight, it often makes short, low jumps clear of the sea surface, splashing lots of water. Melon-headed whales usually gather in large numbers (at least 100 and possibly as many as 1,000 on rare occasions) and sometimes strand together. The melon-headed whale weighs 10–15 kg (22–33 lb) at birth and is 1 m (3.3 ft) long. An adult grows up to 3 m (9.8 ft) long and weighs over 200 kg (440 lb). The whales' lifespans are at least 20 years and probably more than 30 years for females. Their primary diet is squid. Hawaiian melon-headed whales spend much of their daytime at the surface resting. Melon-headed whales are very social animals that live in large groups numbering between 100 and 1,000. They have been observed swimming close to each other and touching flippers. Within the large group, they usually swim in smaller groups of 10-14. Melon-headed whales are also known to associate with Fraser’s dolphins. Groups of the melon-headed whales mix with groups of Fraser’s dolphins and socialize with them. 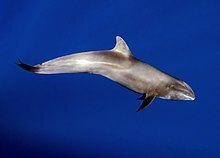 The melon-headed whale also associates with other animals, such as the humpback whale and pilot whale, but Fraser’s dolphin is the most common. Melon-headed whales tend to rest near the surface of the water. They have been observed moving toward the sound of a boat and then riding the waves created by the boat. They are not usually deterred by the sound of the boat. When resting near the surface, melon-headed whales create large splashes when they break the water. Several of them rise vertically out of the water to observe their surroundings and then splash back down, a technique known as spy hopping. At the surface, melon-headed whales also swim quickly, almost breaking the surface of the water and creating crescents ahead of them. The melon-headed whale lives far from shore in all the world's tropical and subtropical oceans. At the northern fringes of its range, it may also be found in temperate waters. Individuals have been sighted off the southern coast of Ireland. Ordinarily, however, the melon-headed whale is found beyond the continental shelf between 20°S and 20°N. Hawaii and Cebu, in the Philippines, are good sites for seeing the whale because the continental shelf there is narrow. Although no specific data exist, the species is unlikely to be migratory, in common with animals in its subfamily. On February 10, 2009, over 300 melon-headed whales were spotted off the shallow waters of Bataan, in the Philippines. Local residents and volunteers guided the dolphins back to deeper waters. Although no definite explanation has been provided for the dolphins' behaviour, two of the three dead dolphins had damaged ear drums. Scientists from the International Whaling Commission claim that damage to the eardrums of melon-headed whales can be caused by high-power sonar equipment such as that used by Exxon Mobil when searching for oil. In Hawaii, group sizes are variable, ranging from a single animal to pods of 800, but typically they are found in relatively large groups (median = 287 individuals). The Hawaiian populations include a large, deepwater group that moves frequently among the islands, and a small, shallow-water population that stays near the island of Hawaiʻi. Melon-headed whales are closely related to false killer whales, short-finned pilot whales, and pygmy killer whales. Hawaiian melon-heads spend much of their daytime at the surface resting. Melon-headed whales were found stranded in South Carolina in 2008. In January, three stranded melon-headed whales were discovered. They were found to have died out at sea and the waves brought them onto the beach. Three more melon-headed whales were discovered after this at different times. Necropsies were done on them; they all had similar infections, hemorrhages, and other problems. However, an actual cause of death was never determined. Many marine mammals have parasites such as Isocyamus delphinii. These parasites (also known as whale lice) burrow into a whale or dolphin, especially where a wound is present. In 1999, a dead, stranded melon-headed whale was discovered and a necropsy was performed on it. Bite marks from smaller sharks were found, and in those bite marks were I. delphinii parasites, 12 in total, which is a record for the number of those parasites found on a marine mammal. Taylor, B.L. ; Baird, R.; Barlow, J.; Dawson, S.M. ; Ford, J.; Mead, J.G. ; Notarbartolo di Sciara, G.; Wade, P. & Pitman, R.L. (2008). "Peponocephala electra". The IUCN Red List of Threatened Species. IUCN. 2008: e.T16564A6077027. doi:10.2305/IUCN.UK.2008.RLTS.T16564A6077027.en. Retrieved 12 January 2018. ^ Froese, Rainer and Pauly, Daniel, eds. (2006). "Peponocephala electra" in FishBase. April 2006 version. ^ "Hundreds of dolphins sighted in Bataan waters". ABS-CBN News and Current Affairs. 2009-02-10. ^ "Dolphins rescued off Philippines". BBC News Online. 2009-02-10. Retrieved 2012-12-24. ^ "Sonar mapping for oil killed whales in Madagascar, a study has found". The Australian. 2013-09-27. Retrieved 2013-09-30.